If you ever wanted to go to bed and not worry about whether your vision will continue to degrade or when you’ll need a cornea transplant, then this may be the most important message your ever read. Now you can experience the explosive burst of self-confidence that happens you when your Keratoconus is stabilized. Imagine going about your day without that nagging feeling like a thorn in your side that you might go blind from Keratoconus. That monkey would finally off your back after all those painfully stressful years. The emotional roller coaster would finally be over. At last, you would be free and full of confidence to tackle any challenge that life threw at you. But it’s MUCH MORE than that. You could finally and confidently live your life without doubting yourself and your abilities. 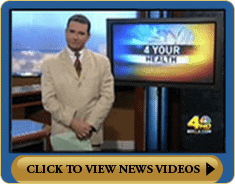 That is the secret behind skyrocketing self-confidence after your Keratoconus is treated. Impossible? Not if you believe in the “miracle of modern medicine” and what so many people are now saying after having their Keratoconus treated. Here’s what this is all about: My name is Dr. Brian Boxer Wachler, M.D. and I’ve dedicated a good part of my career as a pioneering eye surgeon to try to rid the world of Keratoconus. I’ve published three best-selling books on the topic, delivered hundreds of scientific lectures around the world, and treated thousands upon thousands of good people just like you from all across the United States and the world since 1999. I know your eyes make you feel insecure. Your self-confidence has plummeted, perhaps to the lowest in your life. I was once in your shoes with low self-confidence and low self-esteem for a different reason when I was in school. So I can relate. How do I know? Because I see people like you in my practice virtually every day and I am a very good listener. Do your nighttime halos and glare make you afraid to drive at night? Are you worrying about a cornea transplant in your future? Did you eye doctor say, “Just wait until you need a cornea transplant”? or “Nothing can be done”? Are you concerned about your Keratoconus getting worse in the future? Did you go in for LASIK, but were surprised to find out you have Keratoconus? 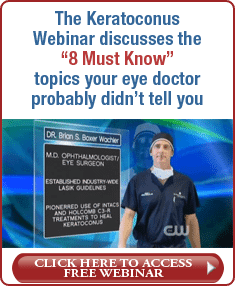 Has your doctor NOT told you about other options such as Holcomb C3-R® and Intacs®? I know what you are feeling because I listen to what patients like you say. I have seen thousands of good people just like you. One set of parents come to mind whose teenage son has Keratoconus, but they delayed in seeking treatment and he lost a lot of vision in both eyes. There was a very nice lady who believed her eye doctor who told her that hard contact lenses hold back Keratoconus. Sadly, that is not true and she lost vision year after year while her eye doctor kept cashing in by updating her contact lenses. Another gentleman was told he has Keratoconus but his eye doctor simply said, “There isn’t much you can do but wait until it gets bad enough for a cornea transplant.” He lost more vision over the years by waiting. These are a few of the thousands of stories I’ve heard over the years – people with eyes holding them back in life. 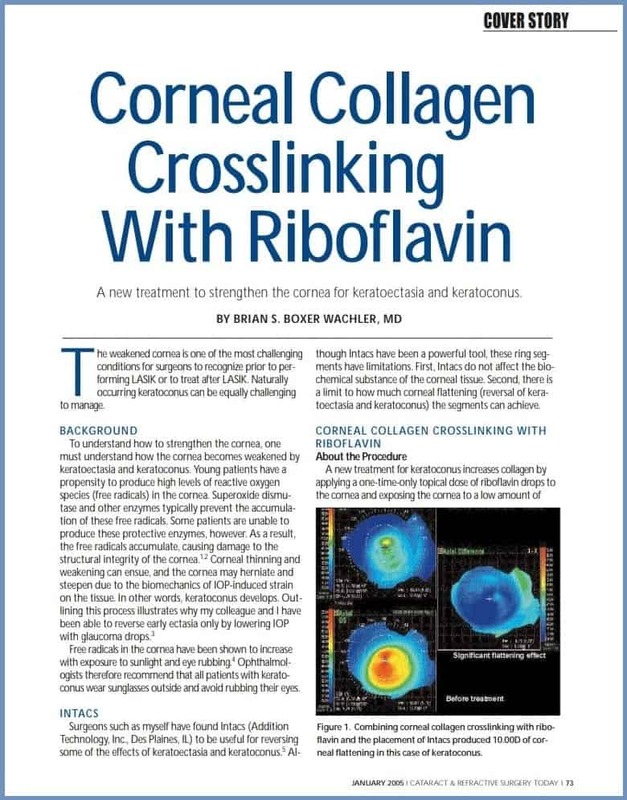 Holcomb C3-R® Cross-linking procedure is the name of a technique that I invented in 2003 using our proprietary Cross-linking Solution applied to your cornea which is activated with a special light. This NON-INVASIVELY (WITHOUT SURGERY) strengthens the natural anchors in your cornea and can stabilize your Keratoconus in just 30 minutes. And it’s only a 1 day recovery. You can usually go back to work, school, and your normal routine the very next day. People are truly “wowed” because of the typically painless, 1 day recovery, with a 99.3% success rate, and can prevent cornea transplants. I know it sounds too good to be true. The reality is, well, that is the reality. The proprietary Cross-linking Solution that I developed is one of several keys to the procedure’s success. Holcomb C3-R® is protected by the United States Patent and Trademark Office. Here’s my landmark publication about Holcomb C3-R® Cross-linking (if you would like to read it in full, just click on the article below). When I made my first scientific presentation about my revolutionary Holcomb C3-R® Cross-linking procedure to prevent cornea transplants at a conference to hundreds of eye surgeons, I mistakenly thought I would receive a standing ovation. No, it was just the opposite. Cornea transplant surgeons tried to destroy my reputation and discredit me because my new procedure threatened their invasive, old way of treating Keratoconus with cornea transplants. It’s a shocking, but true story and even brought me to tears one night. I considered giving up on doing the procedure because of the intense, borderline violent pressure on me from cornea transplant surgeons who desperately wanted to protect “their turf” at any cost. I didn’t give up in the name of helping patients! spacespace If your eye doctor wasn’t supportive of you finding proper treatment for your Keratoconus, then you can relate to my experience of battling other doctors. The silver bullet (more like gold bullet) that shot down many of my critics was United States Olympian Steven Holcomb winning Gold in the bobsled at the 2010 Vancouver Olympics. There was a worldwide tsunami of media attention after Steven’s historic win. There was even more media coverage after he won double Silver medals at the 2014 Sochi Olympics. Before he won these Olympic medals, he had to give up being an athlete. Steven tells how demoralized he was after 12 other eye doctor “specialists” told him his only option was a cornea transplant. His coaches and United States Olympic Team found us. 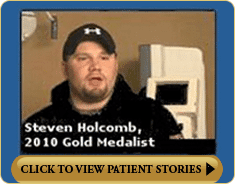 Click on the video link in the box to watch Steven’s powerful story of overcoming Keratoconus to win Olympic Gold and the historic naming of the procedure in his honor – the first time a medical procedure was named after an Olympic athlete. The Holcomb C3-R® Cross-linking System is the only cross-linking procedure with an Olympic Gold Medal behind it. The U.S. Bobsled Team effectively endorsed the procedure when they paid 100% of the fee for U.S. bobsledder Steven Holcomb to have it to save his eyesight. 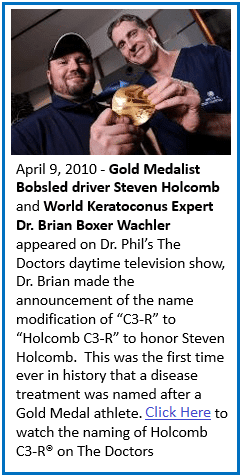 The procedure now bears his name in honor of what Steven accomplished after overcoming his Keratoconus. Finally, you can overcome your Keratoconus too! Holcomb C3-R® Cross-linking System has been a routine part of our practice since 2003. Holcomb C3-R® is NOT in a study – our patients are not required to have the multiple “back and forth” office visits which can be quite time-consuming and disruptive to one’s school or work schedule. What’s ‘CXL’ you ask? CXL is a form of cross-linking (also called “epi off” cross-linking) where the top of your cornea is scraped off with a scalpel-like or dull surgical instrument. Yes, it’s INVASIVE with a VERY PAINFUL RECOVERY. The pain of CXL is caused by scraping off the top of the cornea epithelium (aka skin) that significantly increases risk of infection, corneal haze, scarring, loss of vision, and corneal nerve trauma requiring 6 months to recover. Many patients describe the pain of CXL like having battery acid splashed in your eyes with shards of glasses cutting them at the same time. Sounds pretty horrible, doesn’t it? Because it is. If that wasn’t bad enough, CXL typically requires weeks to months to recover, one eye treated at a time, and has complications discussed above. Compare that to non-invasive Holcomb C3-R® Cross-linking – it avoids ALL THOSE COMPLICATIONS and PAIN OF CXL. With non-invasive Holcomb C3-R®, both eyes are treated same day and you can return to your normal routine the next day! If you wear contact lenses, you can put them in the next day (that’s definitely not the case with CXL). Holcomb C3-R® = Non Invasive, More Effective. It’s SAVING people from significant pain, induced blurred vision that happens when the epithelium is scraped off. Some doctors might tell you, “You must remove the epithelium for crosslinking to work.” That is completely false. If it was true, than we would not have a 99.3% success rate. 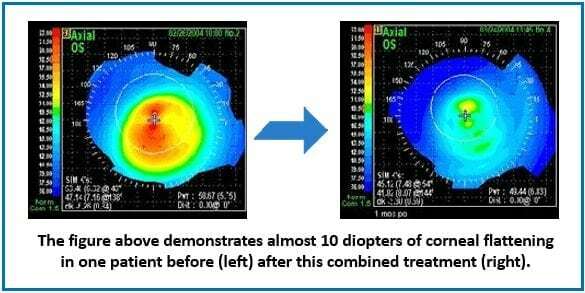 The below photo shows how our proprietary solution penetrates the cornea with epithelium left in place. It is not necessary to scrape off the epithelium for cross-linking and is MUCH safer than scraping off your epithelium. Imagine for a moment that you had to have a procedure on the skin on the back of your hand. Would you want the procedure that scrapes off the skin of your hand leaving it raw and bloody or would you want the procedure that doesn’t traumatize your skin at all? That’s the difference between CXL and Holcomb C3-R® Cross-linking. Sadly 41.8% of patients were STILL having ONGOING PROBLEMS at 1 year after CXL. The above CXL complications have NEVER occurred with Holcomb C3-R® Cross-linking. In other words, the risk of complications of Holcomb C3-R® Cross-linking is about ZERO because the epithelium is not scraped off. After Holcomb C3-R® Cross-linking some people may experience mild irritation for a couple of days. And most people NEVER even experience that. That is the beauty (and safety) of a procedure that is 100% NON-INVASIVE! To sum it up: CXL is a SURGICAL procedure. In contrast, Holcomb C3-R® = Non Invasive, More Effective. Hence, NO COMPLICATIONS. CXL is done one eye at a time. The experience for a patient with CXL is typically so unbearable that it probably won’t surprise you to hear that a number of people REFUSE TO HAVE CXL ON THEIR SECOND EYE. Listen to people who lived through their ghastly CXL experience, then flew out here and had the easy, painless Holcomb C3-R® on their other eye. They thought they were saving some money on travel and convenience by having CXL done locally, but it turned out to be no bargain because of the surprise nightmare they went through (eye doctors may downplay or ignore the CXL risks and pain so patients won’t be scared to sign up for CXL). It’s pretty clear why people would not want to have CXL on their second eye. Another major advantage of Holcomb C3-R® is the special process where both of your eyes can be treated the same time. You won’t have to come back on a different day for your second eye to be treated – as is done with CXL – which you can imagine is very inconvenient to your daily schedule, in addition to the long, painful recovery of CXL. Imagine fighting through the pain and complications of CXL, only to later find out that it DIDN’T EVEN WORK and your Keratoconus keeps getting worse! This is like “salting the wound” and unfortunately we often see people like this. 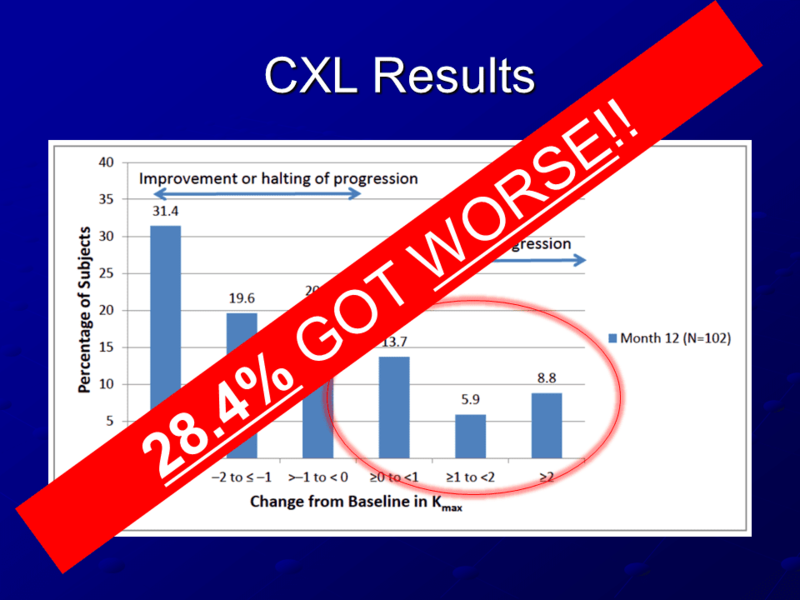 The below graph is from the CXL FDA study – 28.4% got worse (which is failure) as the Keratoconus kept progressing and steepening. 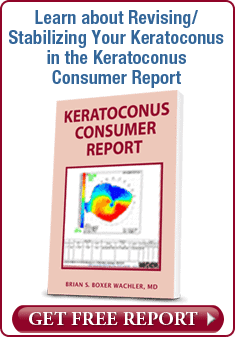 With CXL, Keratoconus got worse in a whopping 28.4% of people after the SHORT follow up period of just 1 year. 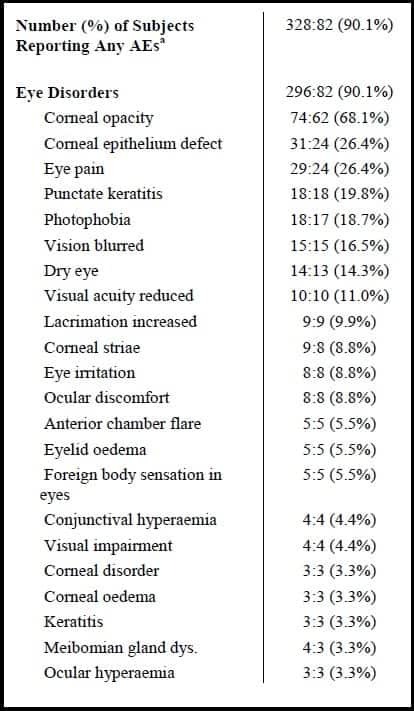 CXL worked in only 71.6% of eyes treated. 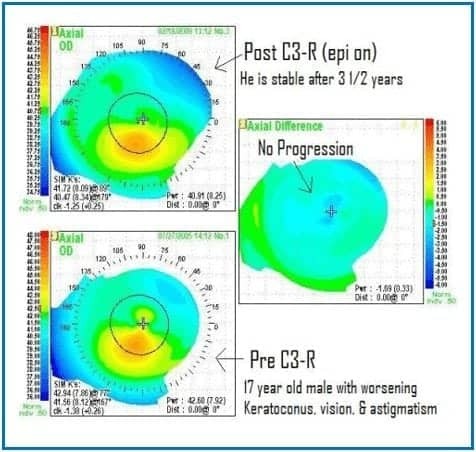 In contrast to the CXL worsening rate of 28.4% at just 1 year, the rate of Keratoconus worsening after Holcomb C3-R was only 0.7% – a 99.3% success rate – and we’ve been performing it since I developed it in 2003. That’s VERY LONG TERM. You can understand the reason people continuously fly here from all over the country and from other countries all the time. What are the Reasons Holcomb C3-R® is So Much Better than CXL? 1) I personally customize the energy level for each eye of each patient. 2) Holcomb C3-R®Cross-linking covers the greatest corneal area for cross-linking – it covers 157% more surface area of the cornea compared to CXL. This allows for a complete area of treatment (your entire cornea) which is important since Keratoconus extends into the periphery of your cornea. We make sure we treat your central cornea areas as well as the far periphery of your corneas with the Holcomb C3-R® Cross-linking System. This is the reason that 99.3% of people are stabilized with just a single treatment with Holcomb C3-R® versus CXL stabilizing ONLY 71.6% of cases. 3) Some doctors are now “trying” epi-on cross-linking. Do not be fooled. 1) They are using solutions that do NOT have the long track of the proprietary solution used in Holcomb C3-R® and 2) Those epi-on patients are being “under-crosslinked” because the device these doctors use has ONLY a LOW energy setting just like for epi-off CXL. Epi-on cross-linking MUST be done with higher energy levels to produce more cross-linking (which we figured out years ago). Our Holcomb C3-R® does that and THAT is part of the reason the success rate of Holcomb C3-R® is 99.3%. Would you trust your precious eyes and the FUTURE OF YOUR VISION AND LIFE to someone just learning or has limited experience with cross-linking or would you trust your eyes to who has the longest experience in the world with epi-on cross-linking? Holcomb C3-R® = Non Invasive, More Effective. With the Holcomb C3-R® Cross-linking System you can be confident in receiving the optimized level of cross-linking treatment for each of your eyes (vs. the “one size fits all” approach of same energy level for all eyes of all patients with all the other cross-linking techniques). Also people with very thin corneas cannot be treated with CXL. Even if you have extremely thin corneas, the good news is you can still be treated with Holcomb C3-R®to strengthen your corneas and help prevent you from needing a cornea transplant. The Holcomb C3-R® Cross-linking System can also be combined with Intacs® to flatten the Keratoconus cone even more than with Intacs® alone. We routinely perform both procedures on the same day. In these cases, the Holcomb C3-R® Cross-linking System can stabilize Keratoconus from getting worse as well as help the Intacs® reverse part of the Keratoconus steepening that had already occurred up to the time of the treatment. The combination of same-day Intacs® and the Holcomb C3-R® Cross-linking System can give you the ideal results of improved vision AND stability. Who Is Having Holcomb C3-R® Cross-linking? Holcomb C3-R® Cross-linking is for just about ANYONE who has Keratoconus. People from all over the United States and other countries routinely fly here for the easy 3-day visit for me to help change their lives and provide valuable peace-of-mind of avoiding a cornea transplant, saving their vision, and boosting their confidence. Since I invented this procedure in 2003 and have performed 7,223 procedures (at the time of this writing in November 2018), you can be rest assured that coming here equates to coming to the pioneer with the LONGEST experience in not only the United States, but the world with non-invasive (“epi-on”) cross-linking. In other words, you can feel secure in knowing that you’ll be receiving the epi-on cross-linking procedure with the longest track record in the world. Because of our unparalleled experience, we have treated virtually every type of person and occupation, including special needs patients. You know the expression “Listen to what other people say about someone”. 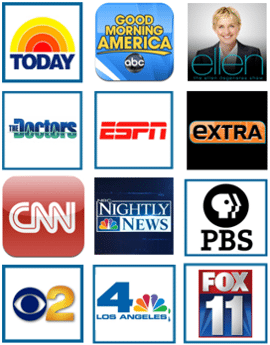 Here you can listen to what people have been saying about their successful Keratoconus treatments with us since 2003. You don’t have to worry as much as someone suffering from contact lens issues, BUT YOU STILL HAVE TO WORRY. 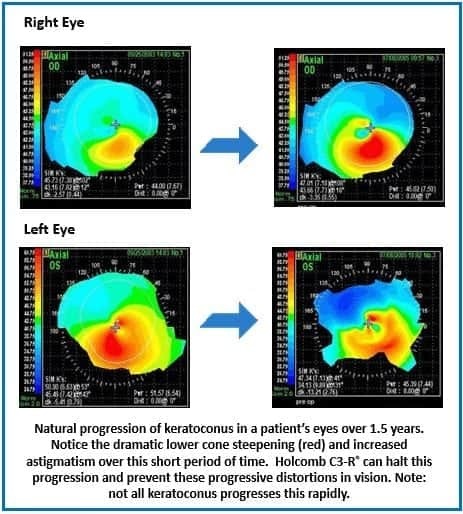 Keratoconus is unpredictable and progressive. “It has a mind of its own” since it doesn’t follow any rules. Holcomb C3-R® is recommended at a minimal to strengthen your cornea and so you don’t have to worry about future vision loss. It is like an “insurance policy for your eyes.” (Actually it’s better than insurance, since insurance fixes the damage – Holcomb C3-R® can prevent the damage in the first place). Thousands of good people like yourself now sleep as sound as a baby wrapped in a warm blanket after having Holcomb C3-R®. This below case of worsening occurred in a young woman, but could have been prevented. 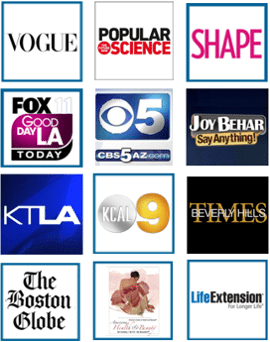 After consultation me, she saw an eye doctor in Los Angeles who was uninformed and advised her not to have Holcomb C3-R®. The result: significant vision loss from delay of treatment for over 1 year. She came back for Holcomb C3-R® which stopped the worsening and further vision loss. Unfortunately she won’t regain the vision she lost during the one year of delay. When you are not suffering, you aren’t very motivated to do anything vs. when you have a lot of problems which is highly motivating. If your Keratoconus isn’t that bad right now, THIS IS THE TIME to do something before it gets worse. Guess what can happen when you take a “wait and see” attitude? Your corneas continue to bulge out and you lose more vision. The risk of waiting is that as your corneas continue to bulge out and get worse, the back layer of the cornea can rip open (called Hydrops) – like someone wearing too tight pants who sits down and the pants split wide open down the middle seam. When this happens to the progressively bulging cornea, the internal eye liquid rushes in and swells up the cornea the same way a dry sponge soaks up water and becomes very thick. These photos below show a Keratoconus cornea swollen up like a soppy, wet sponge after it split open. If this happens to you, it will be 3-6 months of non-usable vision until this fluid goes away. When it eventually does, the cornea will have a lot of new scarring and vision will be permanently worse compared to before it ripped open. The good news is that this devastating damage can easily be prevented with the 30-minute, non-invasive, 1-day recovery Holcomb C3-R® – it will give you important peace-of-mind and confidence. Reason #2 – Many cornea transplant surgeons don’t want you to know about Holcomb C3-R® because their livelihood depends on doing cornea transplants. It’s the unfortunate truth. I hear this ALL THE TIME when talking to people, especially those who flew here from out-of-town for the treatment. As a surgeon who pioneered many procedures over my 20 year career, I can tell you what I’ve observed about many other eye doctors. I explained one reason which you learned about in my TEDx talk – how many cornea transplant surgeons wanted to squash Holcomb C3-R® Cross-linking because it threatened their cornea transplant practices. But there’s another reason. Reason #3 – They don’t want to lose you as a patient. You doctor may not tell you about a treatment that he or she doesn’t offer because of fear of losing you as a patient. Call it ego, jealousy, I’m not sure. I’ve consistently seen this behavior regarding other procedures that they don’t do – and I’ve witnessed this pattern with other procedures by different doctors that solve different problems. It’s sadly so common that it’s got a name: NDH (Not Done Here) Syndrome. That’s not how I practice medicine. For example, if I have a patient with a problem who needs a treatment that I don’t do, I’m quick to make the referral. To me it’s about giving great care to patients to help them, even if someone else is better to deliver that care for that problem. Holcomb C3-R® can treat your Keratoconus and stop it’s worsening as it has for many, many thousands of people who flew here for me and my caring staff to help them. This creates tremendous peace-of-mind for people to know their Keratoconus is stable and won’t likely progress anymore. Wouldn’t it be wonderful to never stay awake at night stressing about needing a cornea transplant? Thousands and thousands of Keratoconus patients have already found the solution in a non-invasive Holcomb C3-R® Cross-linking System. How Can You Have Holcomb C3-R® Cross-linking? Holcomb C3-R® Cross-linking is special and proprietary – it is only available at our office in Beverly Hills, California. If you’re like most of our patients, you don’t live in Los Angeles and you probably don’t live in California. Most of our patients fly here from other states and even other countries. Some of our patients have NEVER been on an airplane before coming here and are really nervous. Other people have super busy schedules. We understand. Here is a quick fact about our practice: 25-30 good people just like you EVERY MONTH travel to see me to treat them and improve their vision, and prevent them from needing a cornea transplant in the future. They come from all over the United States (West Coast, Midwest, East Coast, and the South) and from other countries such as Canada, Europe, Asia, South America, Africa, and as far away as Australia. Every week, people come. Week after week. Year after year. Now decade after decade. Why? Because they TRUST me and my staff. 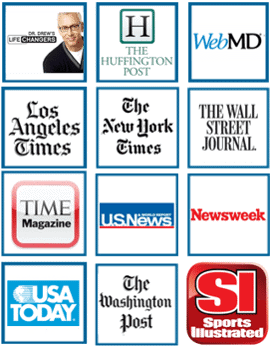 It’s an honor to be trusted by so many people from all over the world. My staff and I don’t take that privilege lightly. We understand coming here is a big step for you and we know you might get this question from friends and family…. Sure you’ll be able to find someone near you so can try to treat you (many surgeons are happily jumping at the chance to do invasive CXL cross-linking procedures and some now dabble in “epi-on” cross-linking especially since Obamacare is affecting their practices), but the reason that 25-30 people every month hop on a plane for the easy 3-day trip is because they want to be treated by me, the doctor who INVENTED these procedures, who has the longest track record in the world with superior results and ZERO RISK OF COMPLICATIONS. That’s the reason you don’t want to have cross-linking done by a local doctor, which is more convenient than flying here, but is invasive, higher risk, and less effective than Holcomb C3-R® Cross-linking. People who want the best possible treatment for their eyes choose to come here. Earlier we spoke about the complications of CXL being 90% at 3 months and 41.8% at 1 year vs ZERO complications of Holcomb C3-R® Cross-linking. You might recall the rate of Keratoconus progression (failure) after CXL was 28.4% vs. Holcomb C3-R® was only 0.7% (less than 1%). (This means Holcomb C3-R® is 40 times more effective than CXL). These are the reasons people fly here from all over the country and from other countries all the time. With Holcomb C3-R® Cross-linking, you can be assured that you are getting “the real thing” that was invented by the authority on modern cross-linking. It’s understandable that some people who you like the most in your life may say to you, “Why would you fly out to Beverly Hills?” in the guise of helping you. Unfortunately they don’t know the facts of how Keratoconus is affecting or threatening to affect your life. They have no idea what it’s like to ‘walk in your shoes’ because having Keratoconus is like being a stranger in an unfriendly, strange land. So when people’s friends or family ask them, “Why are you thinking of travelling to Beverly Hills for your procedure?” They typically answer with, “I deserve the BEST and I want to go to the BEST doctor! I want to finally do something for myself.” Simply put, that’s the reason people like yourself come to us from all over the United States and from other countries. What’s Your Next Step Towards Treating Your Keratoconus and Giving You Explosive Self-Confidence and Peace-of Mind? If you live out of town, that’s not a problem. I am happy to help by providing a complimentary record review prior to you scheduling an appointment here. When you contact us, you will receive your own personal Keratoconus Counselor to assist you with this process. Your Keratoconus Counselor will coordinate a review of your records by me (yes, I will personally review your records, not someone else) and then your Keratoconus Counselor will personally contact you to discuss my preliminary recommendations. Then when you are ready, your Keratoconus Counselor will help you schedule a visit for exam, treatment and follow-up exam all within the same easy 3-day visit. Your Keratoconus Counselor can also help coordinate your local follow up doctor. Think of your Keratoconus Counselor as virtually being with you every step of the way, by your side, from your initial contact with the office through return home for your follow up care. 1 Request a copy of your most recent eye exam from your eye doctor – be sure they include your manifest refraction (prescription) with best corrected vision. 2 Request a copy of your most recent cornea map (topography), if available. 3 Write a brief cover letter explaining your current vision and situation. 4 Include on the cover letter the best phone number and e-mail to contact you.